Here’s a great opportunity for all UK players that loves to bet on Premier League games – get a £20 Risk Free Bet on Arsenal vs Manchester United! This epic battle between 5th placed Arsenal and 6th placed Manchester United takes place on Friday, the 25th of January! The £20 Risk Free Bet! 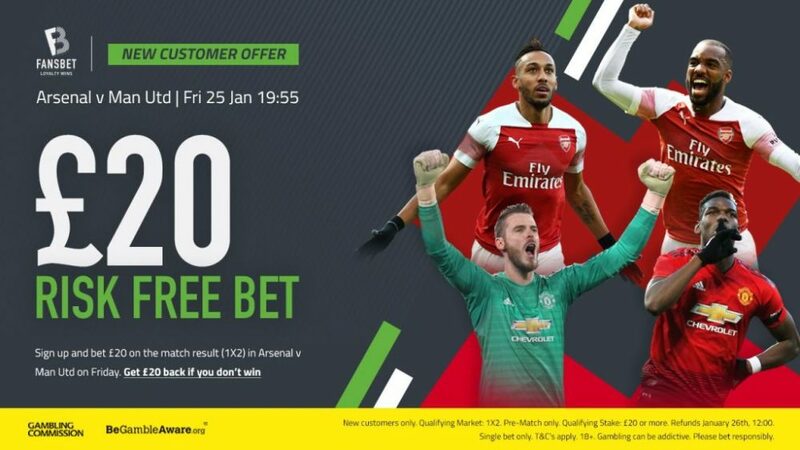 If you sign up at FansBet using the link below and place a 1X2 bet on Arsenal vs Man United, you will get up to £20 refund if you loose your bet. This offer is only available for New UK members of FansBet. The £20 refund is added to your account at 12:00 GMT on the 26th of January and there is NO WAGERING REQUIREMENT attached to your refund! Click here and join FansBet and get a £20 Risk Free Bet! – Sign up and bet £20 or more on the match result (1X2 FT) in Arsenal v Manchester United. – Qualifying Market: 1X2 Full Time (pre-match). – Qualifying Stake: £20 or more. – Bet type: Single only. – Deadline: Friday, 25 January 19:55. – If you don’t win, £20 will be refunded Saturday, 26 January 12:00. – No wagering or clearance requirements. – Only players who signed up after 21 January 2019, are eligible. FansBet was established in 2016 and is a leading online gambling portal. Members can enjoy a top-quality casino that house more than 1,300 games from vendors such as NetEnt, Play’n GO, Microgaming, BetSoft, Yggdrasil and many more. Members of FansBet can also enjoy to bet on sports and fantasy. FansBet is fully licensed by the UK Gambling Commission, the Malta Gaming Authority and the Swedish Gambling Authority (Spelinspektionen). 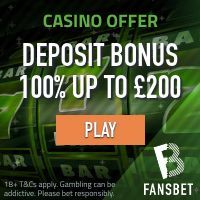 Players located in the United Kingdom: Get 100% up to £200 on your First Deposit! Players located in Norway: Get 100% up to 5000 NOK + 50 Free Spins on your First Deposit! Players residing in Sweden: Enjoy 100% up to 1000 SEK + 50 Free Spins on your First Deposit! Click here and become a member of FansBet Casino! – The bonus amount must be wagered x45. 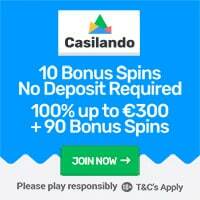 – The minimum deposit for this bonus is £20. – Deposits made using Neteller and Moneybookers Skrill does not qualify for the bonus. – Bonus play on Table Games, Sports Betting, Fantasy or Jackpots is prohibited and will result in bonus cancellation. Bonus money must be used on Slots. – Max wager with bonus money on slots is £4.